Have you entered the Azbees http://www.asbpe.org/azbee-awards? We’re in the process of judging the 2012 entries and we’re already planning for the 2013 contest and we’d like to get your feedback. Do you have suggestions for new categories? Outdated categories that should be removed? Criteria that we should be considering? We added two new categories this year to recognize the growth in smart phone apps and webcasts. And, what hinders your ability to enter the contest? Are the publishers standing the way? The time crunch in getting entries done? The SRDS aspect? What else? We would like your feedback. You’re in the trenches; you want recognition … how best can we do this? Please email me your input at tonieauer@gmail.com, so the National Competition Committee can review and create suggestions for the ASBPE Board. We have more than 1,300 entries that require a critical eye from a quality editor for judging. The commitment to judging can be from two hours on a small category to around a dozen or more hours. We’ll give you the criteria and make it as easy as possible and you’ll have several weeks to get it done. The payoff? You’ve helped colleagues, just like yourself, be judged fairly by a B2B journalism professional. Think you’re up the task? Then, email me your contact information at tonieauer@gmail.com and I’ll follow up with you. In 2012, ASBPE will be sponsoring four Boot Camps in select cities nationwide including Chicago, Kansas City, Boston, and New York. These half-day workshops will educate B2B professionals on the world of social media and digital content. To make it possible for younger editors to attend one of these events, ASBPE will again be organizing the Young Leader Scholarship competition. For the last 10 years, ASBPE has sponsored this scholarship to foster interest in ASBPE by younger B2B professionals who are advancing in their careers. These scholarships are open to all business editors, including print and Web. The scholarships will pay the registration fees and one night of hotel for the winners. Transportation to and from the event, any non-conference meals, and other incurred costs are the responsibility of the winners or their publishing companies. Winners of the award will also receive a free one-year membership to ASBPE. For more information on how to enter the contest, please visit the secure Google Document we have created. Entries are due on March 14, 2012, so enter your application today. For any questions relating to the competition, please e-mail Amy Fischbach at amyfischbach@gmail.com. Did your video series go viral? Was your Tweet one of the few heard around the world? Have you found a freelance assignment because of your branded page on Facebook? Then ASBPE wants to hear from you. The Chicago chapter is looking for social media success stories for its upcoming Digital Boot Camp on April 20. We will be hosting a panel of writers and editors that have succeeded in engaging users through social media. If you believe you’re a good fit, let us know by March 1 by emailing chicago@asbpe.org. ASBPE's redesign goal was to improve its members' user experience. Along with InMotion developers, the site was rebuilt using a WordPress platform. Have you been to http://www.asbpe.org lately? If you have, you may have noticed a few changes have taken place. The association recently unveiled a redesigned website which promises an improved user experience and much more robust functionality. To get the most of the site, we’ll be posting a series of blog posts on the new functions of the website. In this blog post, we’ll cover the new process for logging in to the site, updating your account and your account details. The log-in process for the new ASBPE website is similar to the old process. Locate the Log-In or My Account underlined text in upper right hand corner of the site. Once you have selected one of these options, you will be taken to a log-in screen. 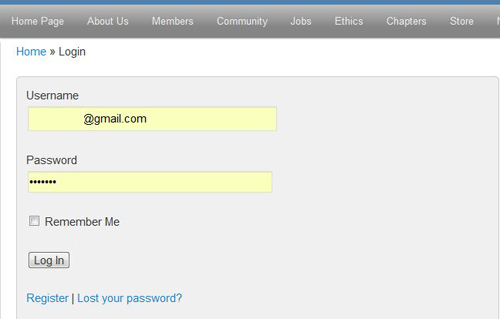 As with the previous site, your user name is the email address you used to create your account. Your password remains the same as it did with the old site. If you cannot remember your password, you can selected “Lost your password?” and reset it. If you do not remember your user name, you can email web-master@asbpe.org for help in identifying the email address that was used. In our next blog post, we’ll discuss how to update your account information. ASBPE is extending the deadline for the Azbees award competition until midnight Friday, Feb. 3. Don’t miss your opportunity to submit your entries into our premier B2B contest. Please note that there will be no more extensions beyond this date, so get your entries in today! You can enter and pay for your submissions online. Simply visit https://www.b-online.com/secure/asbpe/competition to enter the online system. Good luck with the competition and thank you for supporting ASBPE! How can ASBPE help you improve your career in 2012? We need your help! ASBPE will be holding regional boot camps across the United States in 2012. It’s our goal to make these in-depth training sessions as relevant and useful as possible. Please share your training needs with us so that we can better customize the boot camps to suit you. These regional boot camps will be held in lieu of a 2012 national conference. This survey is 10 questions and will only take a few minutes to complete.